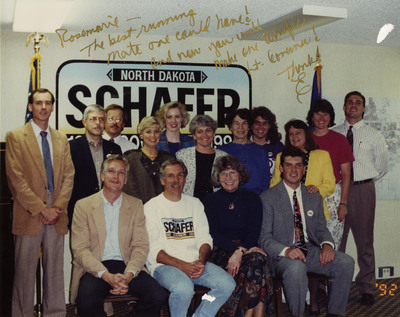 Lieutenant Governor candidate Rosemarie Myrdal, gubernatorial candidate Ed Schafer, and campaign staff sit in front of Schafer campaign sign during the 1992 election. Caption by Governor Schafer reads: "Rosemarie - The best running mate one could have! And now you will make one terrific Lt. Governor! Thanks Ed"